1) I am not getting enough sleep, even though school is out. Oh, Bruiser, you magnificent aging beast, the very epitome of an old dog who cannot, will not learn new tricks, such as sleeping until seven. 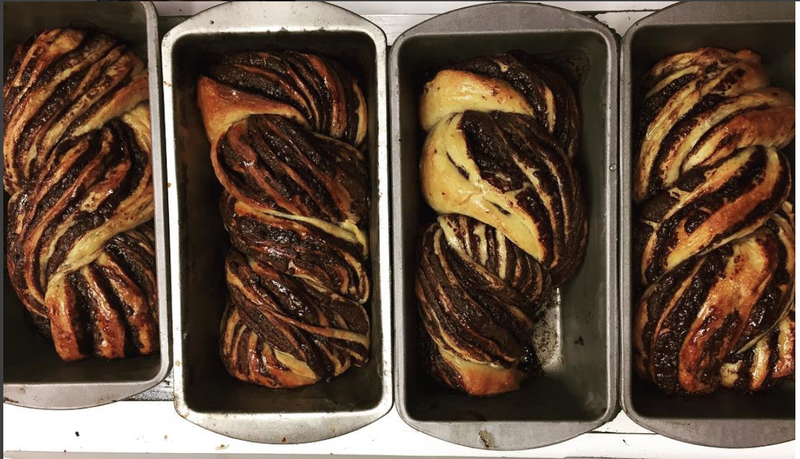 2) Hey, after baking some babka before seven (the loaves had been rising slowly all night), I fell asleep until 10, what the hell. All the flex just flew out of my day. 3) I drove in such a dreamy (/sleep-deprived? you be the judge) state that I missed my freeway exit once and had to drive through hella traffic, and almost missed a different exit, on my way to the gym. Yes, I gave myself a talking to, but that dreamy (/sleep-deprived?) state persisted. 4) Straight up Christmas melancholy. I basically doubled down on it by listening to Carrie & Lowell on my way to an appointment. Just straight up said, shoot the melancholy right into my ears to the universe. 5) Rider to Item #4: Children live so far away. If that is not a legitimate grievance, I don't know what is! 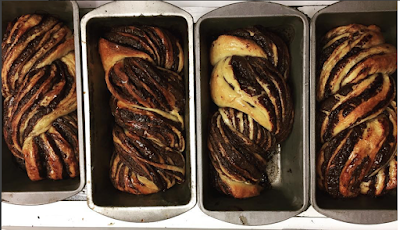 Still, I baked that babka. I ate a piece warm, and it was sublime. I restored myself a little with that morning nap. I had lunch with a friend, drove through the hella traffic to buy the very last groceries (tempting fate, right there) I'll need for Christmas. I worked out. I finished my chest presses. I looked up at one of the giant TVs. Jerry, Elaine, and Kramer are all together, Kramer yet again proving to be a guinea pig in excess, this time drinking several shots of Hennigan's scotch, so Elaine and Jerry can see if they can smell it on him. Jerry buzzes George up. Kramer lunges at him. "HEY." he says, pulling George in close by the crook of the elbow. "I'm going to tell you what I think. I know you don't care what I think, but I'm going to tell you. I think you..." there's some dramatic pausing--"...are terrific." 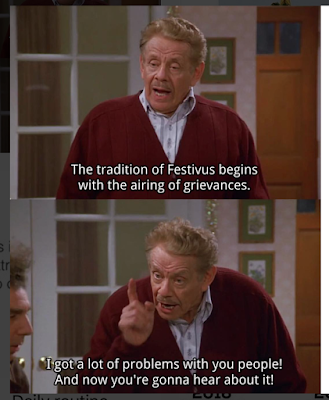 I was never much of a Seinfeld fan, even though I watched it plenty, and laughed at it plenty. The fact is, this episode, with the scotch and the drinking and the declaration of feelings--I don't even know where it occurs in the overall Seinfeldian arc. I did find myself stitching it into my version of the Festivus celebratory practices--the airing of grievances, the feats of strength, the Festivus miracles. Fellow-feeling? Possibly a Festivus miracle. Hey, you there: I'm going to tell you what I think. You might not even care what I think. But I'm going to tell you. I think you...are terrific. I hope you have some babka, or failing that, some other delicious baked good, and sweet dreams, and a nap, should one be necessary if a beloved dog wakes you before there's light. I get up every day, but today I got up with a plan. To be clear: most days I also get up with a plan. Today was Sunday. Sunday, I prefer to keep my plans a little loose. Today, my plan was tight, because my writing group was coming over, I had a lunch to prepare and a lunch, therefore, for which to shop. I had a poem to straighten out so it could fly right. Also, I have other writing to do and grading to do. Also, my environment, especially my study, is a little crazy. Okay, mostly my study. Also my side of the bed. Pretty much anywhere I am keeping my personal possession. So, as you can see, I really needed the plan. Earlier this week, I had my instructional team over for our post-semester review, aka The Post-Mortem. I made some spinach lentil soup and a lovely salad. At the end of my preparations, as I was making the salad happen, I got in a little bit of a hurry and cut my finger. I cut my finger whilst preparing vegetables pretty often. Also, and in a perhaps not unrelated trend, I am often in a hurry whilst preparing vegetables, especially when people are coming over. The people: I should learn that hurrying and sharp knives are a bad mix. But I never do. There I am, slicing red onion super thin, because if you're putting raw onion into a salad, it needs to be super thin so all the sweet can be on the surface and the raw has to hide. That's a theory, anyway, a theory of how to slice an onion. Do you need more cooking theories? I've got loads. Slicing a red onion--right? that's where we were?--and then, a cut finger, which slows down your slicing considerably. My hands have, ever since, been in motion and also a little bit on the raw side. It's cold, for one. A cut finger likes to take its time healing because hands are necessary. For work, you see. So this week, while I trimmed a billion anthologies on the big Duplo DocuCutter, and counted them a billion times in their boxes, in case I missed one, and hung up my clothes for the billionth time, and hung cold wet clothes on the rack, and made cookies, and decorated a Christmas tree, and picked five pears and two persimmons and a wedge of gorgonzola and four Christmas cactuses at Trader Joe's, and made scallion pancakes and squash laksa and a pear cranberry gingersnap crumble, my hands were on my mind. In my practice, when I take a poem out to work on it, it means I open a virtual file and find the latest version of a digital document. If I'm lucky, I find I've left notes for myself on the poem, that will help me to remember where I left off, what I knew I hadn't yet done in the poem when I put it down. I'm working on a poem called 'smart bomb,' set in a car while the speaker was driving to work and a story about the bombing in Syria was on the radio. This was a few months ago, after one of the cease-fires had yet again gone south. In the poem, the speaker turned the radio off, just as I often do, when an interviewer asks a muddle-headed question, or a caller's response is unbearable, or, as sometimes has happened in the past, the host has a cold and her voice sounds phlegmy. Sometimes, I just can't take the sound that the radio makes in my ears. In my mind. In my everything. I guess now is a good time to say that 'the speaker' in the sentences above is, for all intents and purposes, me. I've been thinking about how information--ideas, events, cataclysms--detonate, how its blast ripples wide. I've been thinking about the what to do problem. About the what to feel. Also: about how much it feels like none of my answers are sufficient. Feeling isn't sufficient. Not even doing. In my plans for the week upcoming, I have grading to finish. I have, perhaps, a few more meetings. A finite number, I hope I hope. I have more writing to finish. A lunch with a friend. Shopping for grandchildren. Two little grandsons who will just have driven in with their mom and dad from Arizona, coming over to say hi and bye really quick tomorrow night. I know I will get several reminders of daily political actions in the civic sphere, which is to say, in the world where we live: calls to make, emails to send, places to show up and lend my voice, however I feel. I have necessary sleep I must hold a place for. I hope for a day when I can stay in my quiet house and bake. This last week, I bought some lights on an impulse at Target--dewdrop lights, they're called, little beads of light on copper wire that you can wind around things. In the dark, dark of winter, I do love a glow. The wire and lights came wrapped around a card. You had to unwind, then load three batteries into a little pack, then click a button. The first set of batteries made nothing happen, light-wise--I think I may have lodged one of the three batteries inexactly into its slot. So I patiently extracted the three, then tried another three batteries, and this time, they lit up, brightening at intervals along the wire. I wrapped the wire around a vase of roses, which I also bought whilst shopping for my poetry lunch. The lights illuminated the glass urn, the stems crossed in the still water, the red and white blooming out the lip. I love roses at Christmas. Roses and lights. Roses, lights, and a tree. 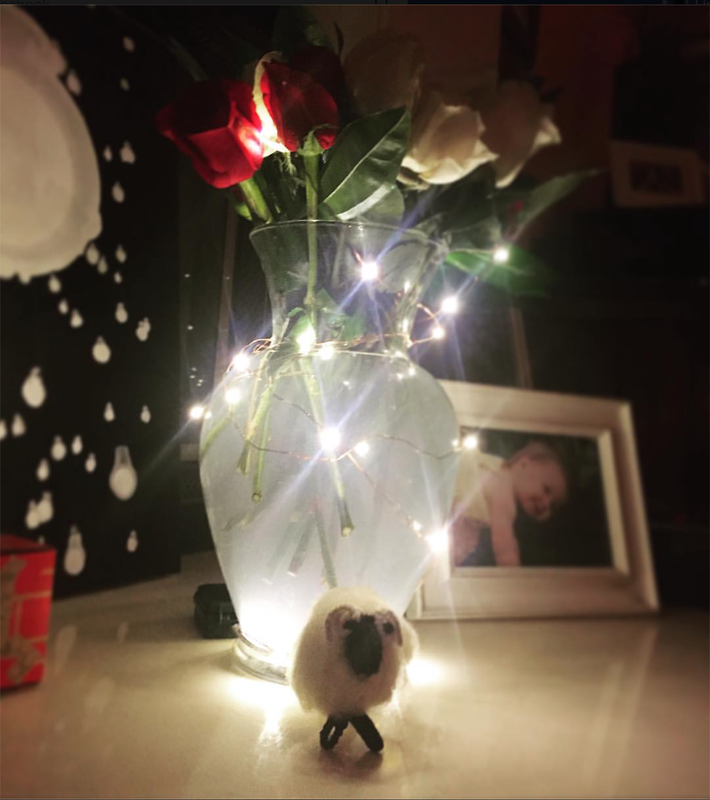 Roses, lights, baubles, and a tree. Roses, lights, baubles, quiet, and a tree. Unwinding and winding a string of light. America, my hair was on fire: an open letter. I trust that you know how I feel about pumpkin pie, especially in November, especially made with a freshly roasted sugar pumpkin. This year, I ran across a recipe that called for maple in the puree, your usual assortment of ground spices, a chocolate crust, and--get this!--a brûléed topping. As in: get out your blow torch, which is always a good time. Whilst preparing my offerings for the family feast, I mentally inventoried--as we all did, I think, America--the various political persuasions of my family members. I thought, as I pierced the skin of the pumpkin with the tip of a knife, perhaps we can all just agree--without ever saying so out loud, or in words--to talk about other things. I pulled the spices from their rack, and guesstimated the measurements, and thought, it'll all be fine. I thought, I might lose it if someone says I have to be grateful for America. Because--no offense, America--America is really making me sad these days. Well, never mind. It's an ugly list. I'm trying really hard to not pick fights--which, I'm not even sure that's a good idea--and you're just going to have to read my mind, America. Hear me out in a private hour. As Allen Ginsberg said, and he should know, "America how can I write a holy litany in your silly mood?" Except substitute sinister for silly. Anyway, I did my thinking-and-cooking, my meditation-and-chopping, my pureeing-and-praying, as you do when the republic hangs in the balance. (America, this is quite serious.) I assembled my salad and roasted my cauliflower and put everything into sensible containers and carried it all out to the car. Oh, and I tested my blowtorch. It worked great. I brought it and extra fuel, for just in cases. We had a beautiful dinner. I was touched that my dad asked me to say the prayer. My nephews and niece were there, and many children, and my sisters and brother, my mom and dad. Me and the historian. Everything was delicious. Because I was full of sass, what with my fancy pie and the drama of a blow torch in the offing, I kept asking: is it time to brûlée the pie? Is it time now? How about NOW? And so forth. It was a little comedy routine and everyone indulged me. So when it came time for the brûlée-ing, lots of people came to the kitchen. It goes without saying that, at precisely this point, my blowtorch decided to take a powder. I added more fuel. I clicked the switch--there was a flame, but it stopped as soon as I tilted the torch to get to work on the sugar. I consulted my nephew, the firefighter. We tested all the various switches and combinations thereof. Nothing doing. More fuel. Still no joy. "I can hear the fuel," he said. I clicked the switch--a quick flame, then a flame-out. "You can?" "Yeah, you can hear it when you tilt it," he said. I clicked it as I lifted the torch to my ear and shook it a little. A collective gasp--at least that's how I remember it--went up in the room. I heard a cascade of your hair's on fire, Lisa, your hair's on fire, and then my nephew patted it out with his firefighter hands. Just like that: my hair was on fire, and then it wasn't. And that will always be part of the legend of that Thanksgiving, with the chocolate crusted maple-scented pumpkin pie brûlée. It was delicious, by the way. America, this may or may not be a metaphor. The fire in my hair, at least. I went back to school on Monday and didn't tell a soul, not because I somehow didn't want to, but because I forgot. I forgot that my hair had been on fire, but it was, and I'm telling you now. America, I have mystical visions and cosmic vibrations. It's not exactly a good time right now, America, but it's time to talk about it. It's time to talk, and deal with the fire, and also--not to be trivial--it's time to share the meal that allows us to do all of that. shouldn't I have known this more piercingly all along? why didn't I know it all along? why didn't I let myself know it? the historian has retired--which is awesome! but it has thrown me for a loop. That list of bullets is, more or less, why I've not been writing. As I considered the things I might write about, the weight of everything seemed so thoroughly to counterbalance it that 'what-I-might-write-about' seemed like feathers. Like piffle. Like lighter than lightweight. I felt terrible for even thinking about writing about, say, pie, or pancakes, or whining in my usual recreational way. I came to talk to you, my partners in verse who build a life’s work documenting their brief time on this earth. I come you to asking to question the landscape of our pastoral muse. I ask you to question what makes you safe? What frees you to write odes of the low country of America, to mention the trees and not their wicked history, to write the praise song of night, but not sing of what dark bodies hide cold in daylight? My family, and I pray we can call each other family, I am asking you to do what you do best: Write. Writing in these dark times feels necessary and also harder: recognizing that writing is always risking not getting it right, and if you only do the thing you already know how to do, you aren't risking enough, you aren't willing yourself to learn. 'Odes of the low country of America'? That's me, folks. Having conceded that, then, what would I write? Poets, if you find yourselves worrying that your poems are not “about” political matters, here is my suggestion: every single time you feel that worry, finish your poem, make it as beautiful as you can, and then do some kind of concrete action. Support threatened communities, or the environment. Pledge yourself to participating in a voter registration drive. Give money to a political organization working tirelessly for change. If you do this, the world will benefit in two ways: from your activism, and from the beautiful poem you have made. Regardless of how poets feel about aesthetic matters, we all agree we are citizens. We have the same obligations to activism and engagement as anyone else. Some poets I know have been working very hard in these ways for a long time. Others of us have been mostly asleep. One of the only good things I can say about this undeniable crisis is that it has made absolutely clear what some have never forgotten: that we all need to wake up and start putting our queer shoulders to the wheel (Ginsberg, “America”). Whatever kind of poetry anyone writes, or whatever art we make, there is always time to do the necessary work of making our society better. It's not like one of these poets, both of whom I admire so much, is right and the other is wrong. It's that I want to write, I want to risk more, I want to try to get it right and have the courage to face that I might very well get it wrong, and still keep trying. I want to hear and respond to the call to speak to my times. I want to make beautiful things with words. I want to write. So, to you, anyone who might still want words from me: Okay, I will.